For the second time in a matter of days, the New York Yankees have added to their pitching staff via trade. On Tuesday, the Yankees added to their bullpen by trading for Zach Britton. On Thursday, the Bronx Bombers addressed a void in their rotation by acquiring lefty J.A. Happ from the Toronto Blue Jays. As part of the deal, the Blue Jays have received infielder Brandon Drury and outfield prospect Billy McKinney. Happ will fill the spot in New York’s rotation that’s been problematic since Jordan Montgomery was lost for the season after making just six starts. With Sonny Gray and Masahiro Tanaka also enduring subpar seasons, the Yankees were desperate to add rotation help before the deadline. Happ may not be a frontline starter, but he’s a reliable veteran who will deliver a solid performance every five days. The 35-year old lefty is fresh off his first all-star game appearance. He hasn’t been able to match his 20-4 season from 2016 in which he posted a 3.18 ERA. But he was one of the better starting pitchers available via trade at a reasonable price. 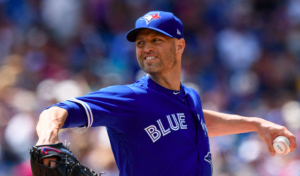 In 20 starts for the Blue Jays this season, Happ is 10-6 with a 4.18 ERA. This trade is a potential slam dunk for the Yankees in the sense that they didn’t give up much. Drury has been pushed aside by the emergence of Miguel Andujar and Gleyber Torres at third base and second base, respectively. McKinney’s future with the Yankees is also in question. Aaron Judge, Giancarlo Stanton, and Aaron Hicks are likely to take up real estate in New York’s outfield long term. That makes McKinney a prospect the Yankees could afford to trade. Meanwhile, the Blue Jays should be pleased with what they got in return for Happ. While Happ is a free agent after the season, Drury is under team control through the 2021 season. He has struggled this season amidst erratic playing time and an early-season DL stint due to migraines. But he proved with the Diamondbacks the past two seasons that he can be a productive major league hitter. He could be Toronto’s primary third baseman next year if Josh Donaldson isn’t re-signed. Drury could also factor in at second base. McKinney, on the other hand, was New York’s no. 20 prospect, according to MLB.com. He was once a top-100 prospect in all of baseball, which may explain why he’s been part of a major league trade three times. While his average has dropped this season at triple-A, he has finally started to tap into some of his raw power. He could factor into Toronto’s outfield plans as early as next season. Ultimately, both teams should be pleased with this trade. The Yankees needed to improve their rotation if they’re going to catch the Red Sox in the AL East. Happ gives them a veteran arm who should win plenty of games with a high-scoring lineup to support him. They also got him without giving up any players they need now or in the future. The Blue Jays, meanwhile, received a couple young hitters who both have a good amount of power. They should be quite satisfied with the return for a rental player like Happ.